Fast convert and rip DVD to MP4 for any MP4 player. Be ready for the greatest tool download practice you have ever felt! Open the many program sections, test the fresh releases of the popular tools, and download software programs for free. Get easy rights to all kinds of computer apps: system solutions and programs, antiviruses, backup software, and many others. The Softempire exclusive software website grows always! Every current hour carries special innovated apps here, the first class software tool downloads. Setup now and recieve a profit! Computer utility software downloads. The excellent programs for Windows, Linux, and Mac! System software for development, management, and support of your computer best practices. Hard disk utility software to specify the status and manage all views of disk drives. Utility software for Mac reviews champions! Get the maximum from your Mac with SoftEmpire! CIDMage is the first commercially-available all-software solution to the problem of generating your own custom Caller ID signals! There are lots of hardware Bell202 modems and test units on the market but all involve costly hardware - not CIDMage! All you need to do to generate Caller ID signals of your own is run CIDMage, enter the name and phone number you want, click Play and hear the signal through your PC speakers! CIDMage generates a high-quality phase-coherent FSK signal (44.1 kHz CD-quality!) that can be played live through your sound card or saved as a .WAV file for later playback on ANY PC, with or without CIDMage installed! With CIDMage you can: - Test your own Caller ID terminals - Put gag and vanity numbers and names on your Caller ID - Place demo numbers on Caller ID terminals on display for sale - Analyze and decode recorded Caller ID Signals WITHOUT EXTRA HARDWARE! That's right, you DO NOT NEED A CALLER ID MODEM! - Experiment with custom Caller ID streams - Set and clear the Message Waiting light on your phone - Send very short secret messages to a friend with a Call Waiting Caller ID device - Dozens more uses!!! All You Need: - CIDMage - A PC with a Sound Card running Windows 95 or later - If you want to Go Live on the phone system, a clean phone line interface (Radio Shack 43-228 or similar) You don't need: - You don't need a special modem - You don't need Caller ID service on your line! 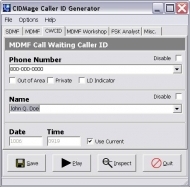 CIDMage can: - Generate MDMF Name and Number Caller ID - Generate Call Waiting Caller ID - Generate Number-Only Caller ID (for early CID terminals) - Generate Voice Mail Waiting Indicator signals (turn the Voicemail light on or off!) - Show you a detailed byte-by-byte breakdown of the signals it generates - Analyze and decode recorded Caller ID signals from the phone company! Take control of your outgoing Caller ID - try CIDMage today! CRT is a rock-solid terminal emulator with advanced session management, a multi-session tabbed interface, scripting, and numerous emulations. CRT supports SOCKS and generic firewalls, transparent printing, Xmodem/Zmodem, ActiveX, and Windows TAPI. Absolute Uninstaller Free Version makes your computer run more efficiently by removing folders and files that were left after you uninstalled software.